The good news is that wolf worms in cats are fairly rare. The bad news is that if your cat is invaded by a wolf worm, formally known as a cuterebra, it's one of the most disgusting things you might ever see. Imagine a hole on your cat, out of which emerges a large worm. In reality, it's a botfly larva. 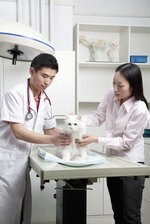 Your vet must treat a cuterebra infestation, since it's imperative to remove the entire larva from your cat's body. Kitten being examined by veterinarian. Female botflies lay eggs near nests of the principal hosts, generally rabbits or rodents. Felines aren't primary hosts for the cuterebra, but outdoor cats can pick up the parasite while checking out the living spaces of wild creatures. The larvae enter the cat's body through orifices or wounds, not via skin penetration. The best way to prevent cuterebra transmission to cats is by keeping them indoors. If your cat develops a large, cyst-like lump on his head or neck, seek veterinary care. Although the lump can appear in other areas, it's uncommon. You'll see a small hole in the lump -- that's how the larva get air. You might spot movement within the lump. If your cat can reach the growth, you'll notice him constantly grooming the area. Pus might come out of the hole, the result of a secondary infection. If untreated, the larva comes out of the hole approximately 30 days after infesting the cat. After identifying the lump as cuterebra, your vet will remove the larva using forceps. The larva isn't necessarily easy to remove -- it retreats from the forceps and must be fished out. It's important to seek professional help to remove the larva rather than doing it yourself because any part of the larva left behind can result in a severe bodily reaction in the cat. After the larva is gone, your vet will flush out the site and remove any unhealthy tissue. It can take some time for the wound to heal. Your vet might prescribe antibiotics for your cat. While most cats recover promptly from a cuterebra infestation, it can prove fatal if the larva migrates to the brain. Cats with larva in the brain develop neurological problems, including vision loss, circling, head tilt, behavioral changes and seizures. The larva might attempt to exit through the nose, resulting in breathing issues. Since the neurological symptoms resemble other disorders, your vet must perform magnetic resonance imaging on the animal's brain. If the brain damage is extensive, your vet will recommend euthanization. If caught when symptoms first begin, your vet can administer medication to kill the cuterebra. Some cats might fully recover, while others will continue to experience neurological problems.